As time was limited and a weather window had opened we arranged for a boat drop of near the settlement of Sermiligaq. The coast between Tasiilaq and there was old ground to us and would take at least 3 long days to cover, so time saved now would give us more scope to sit out bad weather should it come later. The ride out in two fast boats owned by local hunters was fantastic. Greenland at its best, with clear blue cloudless skies and mirror calm, sparkling crystal seas. 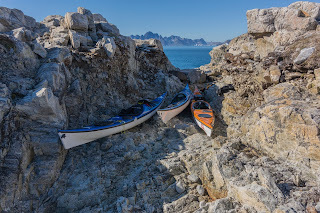 Our drop off was on some previously visited flat smooth rocks, where we could organise and pack our kayaks. Camping and the water supply was good, should we not be able to fit everything in our kayaks a secure food drop could be stashed for later pick up, as we intended paddling back this way to my base in Tasiilaq on our return. When kayaking in Greenland, mileage, distance, effort, commitment, time until lunch, a landing or break stop are all measured in “Thumbs”. On average we paddle one thumb an hour. With a fully loaded kayak a typical day where landings were numerous for rest breaks would involve perhaps a five or six thumb day. Our route into Lake Fjord however had limited opportunities for landing and finding camping sites at the end of the day and we knew we were in for some long days. Pacing ourselves was important; paddling with a partner to chat with is an obvious technique to avoid fatigue and boredom. (I’m not sure boredom is the term applicable when kayaking in such a stunning environment, but you know what I mean) We also agreed to keep close together and raft up on the water for a 5 minute snack or comfort break every hour. Daily progress was good and constant notes were added to the maps as we went. Any new potential landing sites or water sources would be useful information to have on the return trip. Usually when I guide commercial trips in this area we aim to have a team of 8. This allows for reasonable bear watch shifts during the night. However with just five of us this was not practical, especially as we would be more fatigued and require a good night’s sleep. In an attempt to safe guard ourselves, but perhaps as much as a psychological measure, we would set up trip wires around the campsite at the end of the evening. These were very sensitive and were often set off by the wind, fox’s or folk going out for a pee. Not ideal, but for sure better than nothing. We also carried two pump action saw off, 12 gauge shot guns, with solid slugs on the kayaks in specially made waterproof gun sleeves. 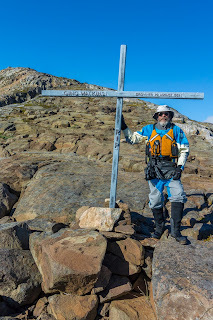 Depot Island was a major mile stone for us. James and I had been there before in 2014. Unfortunately on that occasion James had become ill and I had had to arrange his evacuation to hospital. As a result he had some serious ghosts to lay to rest. We knew the landing on Depot was poor and that the sea covered the small stony beach for much of the tide. However we landed perfectly on time and rushed to empty the kayaks, so we could haul them up onto safe ground. The first time I came here in 2002 there had been an old hunter’s cabin on the point – sadly this is now long gone, so we set up camp and spent the evening exploring the remains of some old turf houses and graves. The next day was foggy, very foggy. Paddling on the GPS was perhaps not essential, we could have managed. However we had a long day and didn’t want to waste any time going out of our way. Also there were a lot of huge icebergs guarding the route ahead and we didn’t want to increase the risk these posed us by being in the wrong place or in fact any place longer than we really had to. The island of Stor and the old settlement at Sartermit was our objective that evening, a long exhausting day, but with the prospect of a hunters cabin at the end of it to save time camping. Also a bear worry free night. Although rarely visited, this hut is still occasionally used in the winter by hunters. Unfortunately it was full of their rubbish and mess and the smaller original hut had for some reason been partly dismantled. I am not adverse to cleaning house before I move in, but on this occasion we were all too exhausted and elected to paddle on and find a nice clean campsite. Three hours later saw us back near the huts setting up the tents. It’s quite amazing how a section of coast can be impossible to land on, even from a kayak and have such a lack of camping potential. So a long hard day had just become even longer. (8 hrs + on the water) Not what we had wanted the day before our crux and longest day. Stor Island to Lake Ford was in my mind the crux of our route and would involve a 9 hr day with no landings. About 6 hrs in we would have to pass the headland referred to as “Hells Corner”, if this proved impossible we would have to retrace our route. 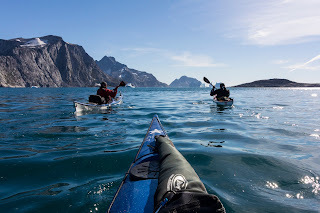 If it was negotiated we would then be committed to a not insignificant crossing of Nigartusuk Fjord, where winds can funnel out to sea, before reaching Ailsa island which marks the entrance to Tugtilik (Lake Fjord). Conditions were clear, although once out of the shelter of Stor Island the sea became a little lumpy and kept us on our toes and caused us to worry of what might be in store later in the day. 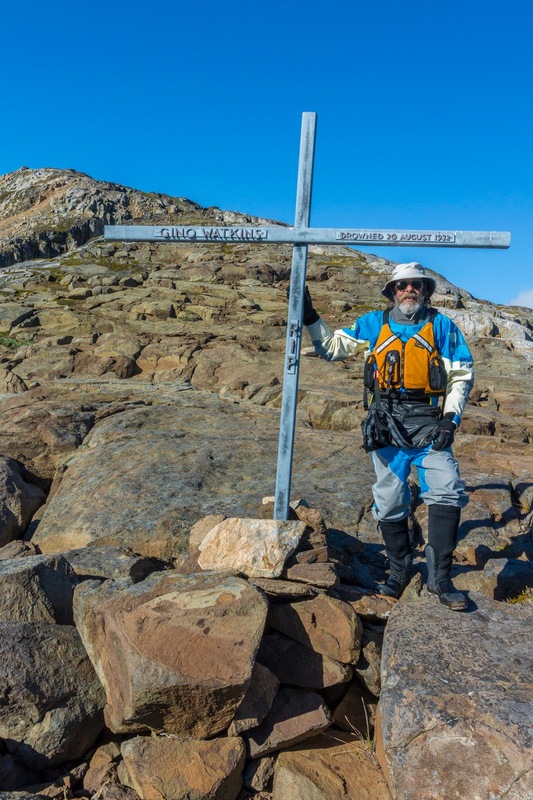 We landed on the point and were pleased to discover the cross still standing from 2010. After a suitable reflection and photo session we paddled up the left hand branch of the fjord to set up camp by the remains of Watkins base camp. We were lucky that the tide was high – I had completely overlooked how far it went out and ½ mile of mud would have been the last straw at this stage in the day. We had intended spending several days mooching about and exploring. It’s a pretty intimidating place though and we all recognised how exposed we were, and considering the conditions how it would be very easy to get stuck here for some time, if they changed. Or, if we went at the wrong time, how easy it would be to have a real epic or worse, trying to get back to Stor Island. So we made a plan and agreed to explore as much as we could that evening and then the next day, which could also be spent as a bit of a rest if folk needed too. Then at high tide (1600) that same day, we would launch and return while we still could in calm conditions. Initially exploring the remains of the hut site we found the foundations, timbers, stove pipes and tins, coal and general rubbish from the 1932 expedition. We were sure Gino and the team would not begrudge us a fire that evening after our long day, so carefully selected some of the more rotten wood for our fire. The next day we managed to salvage the remains of the whale boat from the beach. (Although it is mentioned in the books, it’s never been confirmed that they took it back to Angmagssalik) I knew it was there from my visit in 2010 and was keen to get it up onto higher ground where it would suffer less damage. John and Donna walked up and round the lake and discovered a number of old 45 g fuel drums, which can only have been placed there to re fuel the sea moth during the 1930/31 expedition. James and I started looking for my missing link, the carving on the rock done by a crew member of the Maagen. There was no sign of it anywhere. In desperation having re read the passage in the book, I said to James, “well, where would you carve my name if it was you” He shrugged and gestured halfheartedly to a slab of rock. As I glanced at it the sun caught the rock and there it was – so faint it was barely visible, we had found it. Trouble was it was too faint to photograph. So again reasoning Gino wouldn’t mind we used some of the coal left from his base camp and highlighted the carving. We strongly believe no one would have seen this since 1932, other than when Riley and Rymill (by then old men) returned in 1982 by boat to mark the 50th year of Gino’s death. It would have been too faint to see if you didn’t know exactly where it was or were seriously hunting for it, as we were this summer. 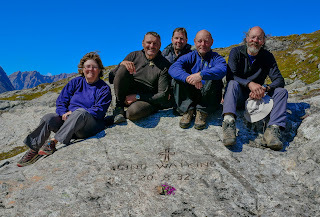 So it was a great success, we had reached the memorial cross, camped at and explored his base camp, rescued the remains of his boat from the storm boulders on the beach, discovered remains of old fuel drums at the lake, left there for the sea moth in 1931 and located the inscription on the rock slab behind the hut site – now we just had to get out and home safe. It was a quiet team that launched and paddled off that afternoon on the 4 o’clock high tide. Everyone with their own thoughts of what would transpire during the next 9 hrs. 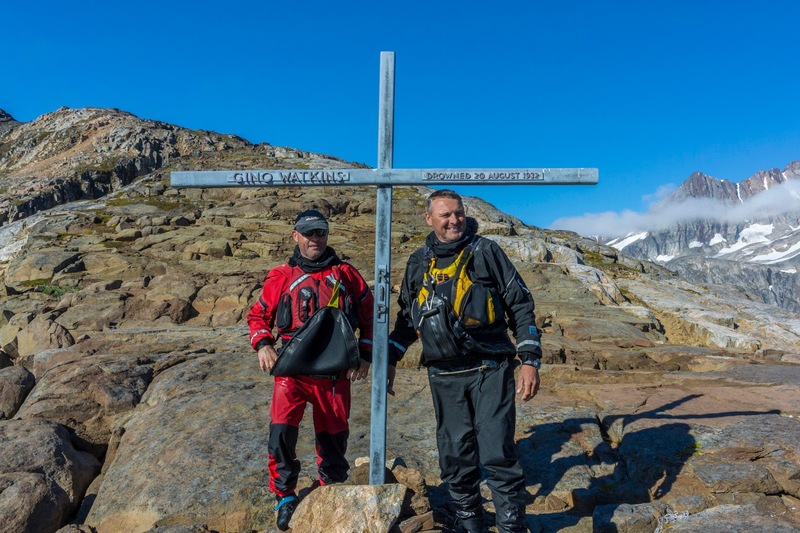 Also thoughts of what had inspired them to come here in the first place, and thoughts of what it would have really been like, back in the day with no satellite phone, Epirb, Gortex drysuits or GPS. Quite humbling! The sea was pretty lumpy and the tide strong, but as the evening set in we were rewarded with a fantastic light and sun set, such as it is at this time of year. We only noticed how late it was when we started to get cold, by then it was midnight and we were back on the relative safe side, with “Hells Corner” far behind us, guarding a very special place, few ever venture into. The next day was designated as a rest day and faff about with kit day. We were at a fantastic camp site at the head of the fjord, where huge icebergs go to die and the noise all day of breaking ice was a constant reminder (not that we needed one) of how insignificant we were. Heading back to Tasiilaq over the next 2 weeks was an adventure, but of little interest to others so I won’t go on about it here. However we stopped again at Deport Island, for old times’ sake and investigated several other areas mentioned in the various Watkins books. All in all, another great summer. So to plans for the future..... Geoff is off to Antarctica in Feb 2017 with Caffin and Edwards, on a mission to retrace some of the “Southern Lights” expedition. Donna is also going on a kayak trip to the Antarctic in 2017. I will be back in Greenland guiding three expeditions in 2017 during this time we plan to visit the 1930 BAARE base camp and recce a route onto the inland ice. In 2018 I am planning a sailing expedition from Shetland, going into Lake Fjord to recover the remains of the whale boat and then sail down to explore the 1930 / 31 base site and put a team up onto the glacier . It is hoped that James will accompany me on both adventures. As yet John has made no plans, but I am sure he will be back in the future.